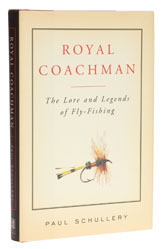 The dust jacket quotes the author describing fly fishing as “this great adventure we have in a thousand little episodes” and Royal Coachman adds another fourteen such episodes to Schullery’s already rich repertoire. This is a great book for reading by the fireside on a winter’s night and quite apart from being very well written, one of its greatest strengths is the way the author isn’t afraid to have a go at some sacred cows in passing. So for example, the chapter “Arts and Crafts” takes a crack at the whole mythology of bamboo fly rods and what Schullery describes as the “caste” system that has grown up around them, while “Royal Coachman and Friends” details the history of a famous fly and how its own success has overwhelmed it, so that the original tying is getting harder and harder to obtain. A most enjoyable book. If you haven't read any of Schullery's books before, this one is a great place to start - he has a happy knack of being able to make the past speak out and that, coupled with his relaxed and tremendously readable style makes every one of his books stand out from the crowd.